We design outstanding houses and commercial buildings that are energy and resource efﬁcient. In recent years, it has become viable to produce structures that have energy requirements that are small enough to be met on-site by solar photovoltaic (PV) panels. (see Zero Energy page for more details). A building should enhance its environment and look like it belongs on the land. The best design solutions come from a recognition and response to both the positive and negative attributes of the site. Handsome design is a fundamental function of the built environment. Beautiful homes and buildings are well-loved and cared for, and will therefore endure. And making buildings that last is a central principle of sustainable design. To divorce us from the environmental, political, and economic costs of fossil fuel energy, we design all new buildings to meet their own energy requirements. Homes that are not designed this way will a have to undergo a far more costly retroﬁt in the future, with often compromised results. To create buildings that last without mold, insects, and rot, we need to apply the most current lessons from building science research. Higher levels of insulation and greater air tightness demand a deeper understanding of how buildings can be made to reduce maintenance and increase durability. Virtually any modern structure, no matter how tight or leaky can have indoor air quality problems. Our approach begins with eliminating toxic materials that can affect indoor air quality, and continues with a ventilation system that provides fresh air throughout the building. We specify building materials and systems that don't contribute to the depletion of natural resources, don't have a high embodied energy content, and don't represent pollution problems in manufacture or in place. Structures that are designed to adapt to future changes are likely to survive, and their occupants will be able to maintain the utility of the building even as their needs change. This is as true for a home that allows its owner's to age in place as it is for a commercial building that can sustain multiple uses during its lifetime. From foundation to roof, we put an extraordinary amount of thought into every detail. This applies to the building structure, insulation, and enclosure, as well as the interior fixtures, finishes, and trim. And due to our extensive background in construction, we can and do provide exceptional field services. We have designed very small houses and not-so-small houses. 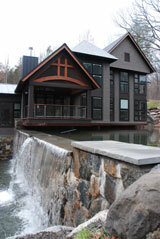 Some of the images on this site may give the impression that we are strictly large custom home designers. We enjoy working on small (even tiny), well-detailed, exceptional, buildings as much as we like the larger ones, as long as the combination of extreme energy efficiency with elegant, unique design is the goal.